What’s a family dinner without homemade biscuits!? Here in the Maritime Provinces of Eastern Canada, biscuits are a staple at family gatherings and dinners. They are the perfect biscuit to soak up extra gravy with, and are just as delicious on their own slathered in fresh butter. 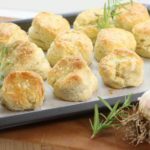 A lot of folks will go out and buy pre-made biscuits or even a mix to make at home, but from scratch garlic biscuits really do stand out above the rest. So much so in fact, that throughout the year locals here on Prince Edward Island will even order them in advance from restaurants to ensure fresh home made biscuits for special occasions. This always surprised me since making homemade biscuits from scratch really is not that difficult. If you have a few basic ingredients on hand, you can easily whip up a batch in half an hour and serve them hot for dinner. 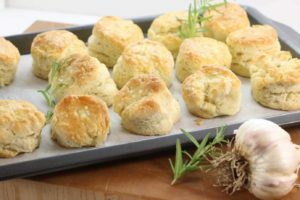 Making biscuits yourself at home also gives you the advantage of being able to flavour them with herbs and other seasonings, like these rosemary and garlic flavoured biscuits I made this week. You can easily substitute the herbs for any others you may have growing at home such as thyme, sage or even oregano. If you have never made biscuits at home before, don’t worry I’ll walk you through this incredibly easy recipe! Start by mixing all of your dry ingredients together in a bowl. If you can sift the flour and baking powder through a mesh sieve to ensure there are no lumps. Add your sugar, minced rosemary and garlic. Mince the garlic really fine and then rub it on the cutting board with the flat side of your knife. This softens up the raw garlic and presses out some of the oils. If you omit this step and add just the raw minced garlic you may end up eating a biscuit and biting into a chunk of garlic! 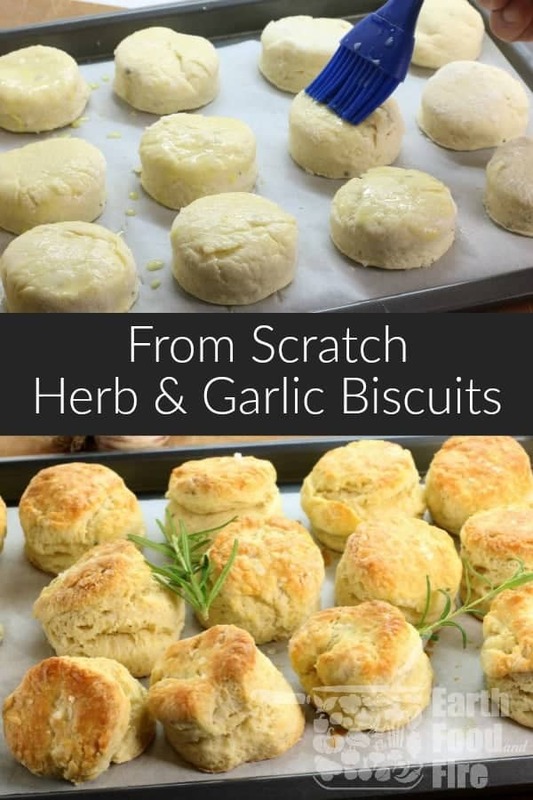 Rubbing the garlic creates a more subtle flavour in the biscuits. Once the dry ingredients are all mixed together, take your cold butter or lard and as if you are making pie dough, crumble the fat into the flour with your hands. Make a small well in the middle of the flour mix, and crack the eggs into the middle. Add your milk and using a wooden spoon, stir the eggs and milk together. This helps smooth out the dough and prevents it from crumbling apart when you got to roll it out. If the dough is still a little wet and sticky, sprinkle some more flour over it and knead it in. 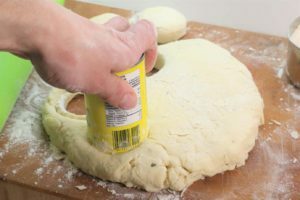 Roll out the dough until it is about half an inch to three-quarters of an inch thick. To cut out the individual biscuits you can use any size ring mold, lid or can depending on your preference. I keep an old tomato paste can with both bottom and top cut out as a ring mold to punch out the biscuits. Make sure to dip the edge of whichever mold you decide to use in flour first to prevent it from sticking to the dough! We are looking for nice clean edges! Pre- heat your oven to 375F and as the oven pre-heats, line the biscuits on a greased or parchment-lined baking sheet. When traying up the biscuits make sure not to space them out too much. As the biscuits bake, steam escapes from them and this heat helps the biscuit next to it rise straight up. If the biscuits are spaced too much you may find they will flop over and dry out easier during the baking process. Before loading the tea biscuits into the oven, brush the tops with a little egg wash ( whole egg mixed with a splash of water or milk) to create a nice golden brown crust, and sprinkle with a few grains of coarse sea salt. Bake your delicious rosemary and garlic biscuits between 12 and 15 minutes, turning the tray at the very end to ensure they brown evenly. As you can see making homemade biscuits from scratch, really is not that difficult even as a beginner cook/ baker, and can be done quite quickly. Give them a shot, and try this super easy recipe at your next family get together! Let me know how they turn out by tagging us on Facebook, Twitter or Instagram! 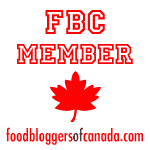 You can also follow Earth, Food, and Fire on Pinterest and Yummly to always have these yummy recipes within arms reach on your smartphone! 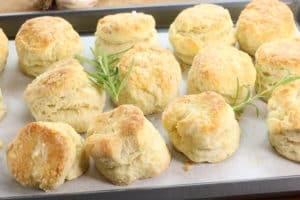 From scratch biscuits are a must at any family gathering or dinner. Try these super simple rosemary & garlic biscuits tonight! Add the minced herbs and garlic. Crumble in the cold butter or lard as if you are making pie dough. Make a well in the middle of the mix and add the eggs and milk. Slowly stirr in the flour until everything is evenly mixed. Knead the rough dough on a floured countertop for 15 to 30 seconds until smooth. 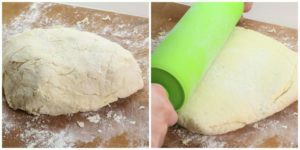 Roll out the dough until it is about half an inch to three-quarters of an inch thick. Punch out individual biscuits with a ring mold or appropriate mould. brush with egg wash and sprinkle with coarse sea salt. Bake at 375F for 12 to 15 minutes until golden brown. Does margarine work for this recipe? Margarine would work in theory, but your biscuits will come out of the oven much denser in texture. The moisture present in the butter that is crumbled into this dough helps puff up the dough as it rises making the biscuits nice and fluffy. They look and sound fabulous! Book marking to try. I often think you can judge the seriousness of a chowder by what it’s served with and biscuits are king. These biscuits are so nice and tall! Will have to try this recipe. Thanks! I agree that homemade bread and rolls are the best-the flavors in these sound perfect! Plus they are ao easy to make! We love homemade biscuits (no store bought ones or ready mix for us!) and yours flavored with garlic and rosemary are super tasty! They look so flaky and buttery! These look amazing! My husband makes a similar recipe as well. And whenever he does, they get eaten up real quick!